This set of pencils make a perfect addition to your score book or score sheet during a tournament, as well as great prizes or gift ideas for your school or chess club. 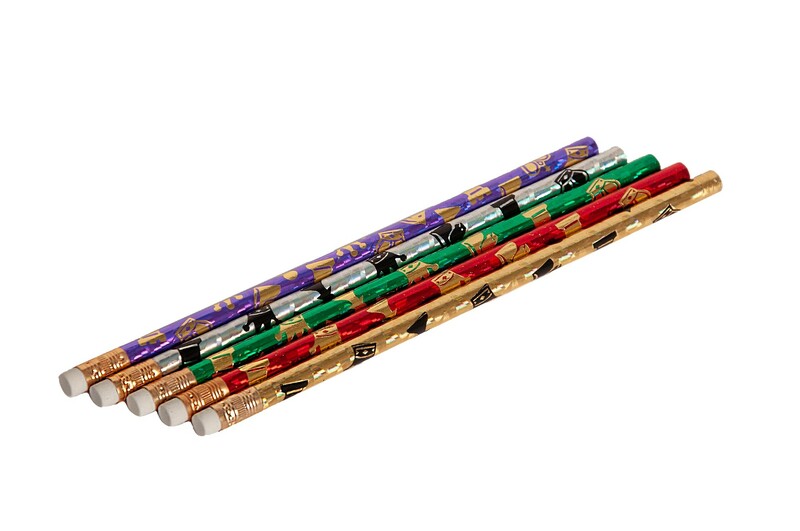 With the purchase of these pencils, you will receive 5 individual, brightly colored pencils - with a shiny metallic finish and stamped with black and silver chess pieces. Each set includes a gold, silver, red, green, and blue pencil. Please note that, when you are ordering multiple quantities of this product, you are ordering 5(pencils) times the quantity ordered. Ordering a quantity of 5 will equal 25 total pencils (each set containing 5 different colors, so you will end up with 5 of each color - total.) These sets of 5 pencils are not packaged seperately, so you will receive your total order combined into one package. Actual colors may vary.